So Fashionably Frugal: Colorful Crop Tops! Hey guys! 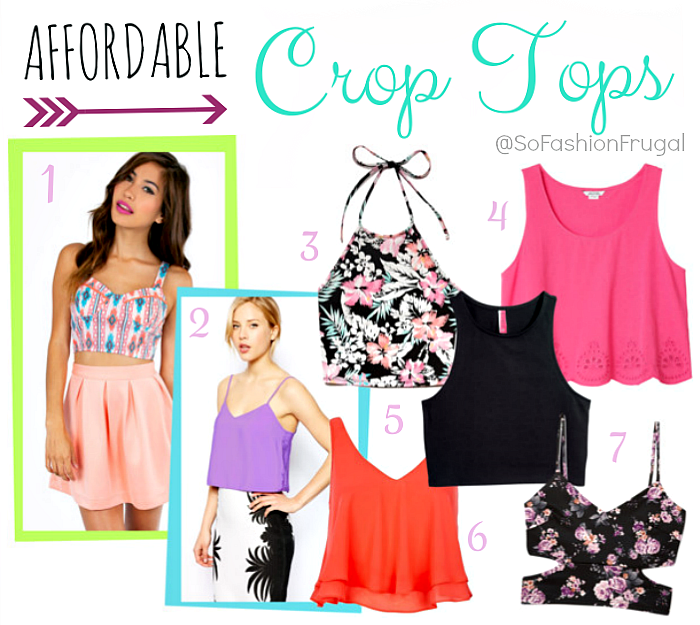 Today's post is all about crop tops! Colorful ones that is! I love these tops right now because they are so fun and unique...and can really bring out an outfit. Don't get me wrong, this kind of top can be a little intimidating at first. But don't worry about it...seriously! Crop tops paired with high waist bottoms (skirt, shorts, etc) only reveal a small amount of your stomach. Basically, the higher the waistline of your bottoms, the smaller the amount of stomach will be shown. So you can easily use them to your preference! What celebrity do you think pulls off the best crop top look? My vote personally goes to Jamie Chung...she makes them look so polished and classic. A lot of celebs prefer showing more skin, but she doesn't--which is awesome!